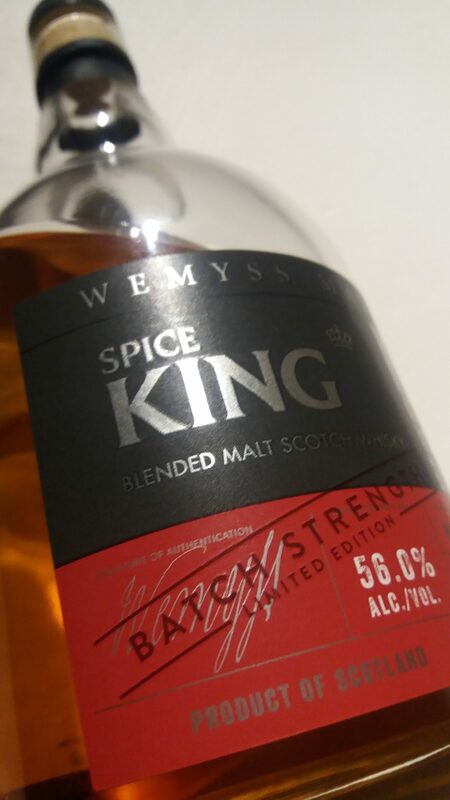 General facts: Yep, another blended whisky and this time a blended malt from the independent bottler Wemyss. It consists of a mix of whisky from a bunch of different Scottish distilleries (one source mentions the number 10, but I can’t confirm that) The ABV is at substantial 56 % and this batch is not chill-filtered, however, it is artificially coloured with e150. This release comes in 6000 bottles and costs around £45. It’s a NAS-whisky (non-age-statement). Nose: Right away I notice a big, malty sweetness. Creamy fudge, a big dollop of honey, some nuttiness. Walnuts, or perhaps pecan. Kind of like Caramel Pecan Pie, but not as “in your face” with the sweetness. There’s a tingeling sensation when nosing which isn’t strange considering the ABV, but overall the nose feels incredibly round and inviting. Warm, fresh wood. Warming, cosy spices with cinnamon, cardamon and some clove. Tinned peaches and just a hint of fresh mint. After adding some water the nose becomes breadier but also gains some citrus notes. Orange, more specifically. A floral note also becomes present, reminding me of Schersmin. Taste: Opsiedaisy, a bit more cocky than the nose gave away! Still a whole lot of spiciness to it, but now with caraway as a welcome addition. The nuts are definitely toasted, almost burnt, and there is also a creeping sensation of peat smoke going on behind the scenes. The taste is more herbal than the nose with some tarragon, and even if the taste isn’t as sweet as the nose the honey is still definitely there. After adding water the burnt note becomes more evident, together with some freshly ground black pepper. Finish: Medium to long aftertaste, which takes its beginning in caramel and some chocolate (Daim!!) but then goes via that clear honeyed feeling towards subtle peat smoke, and the lasting impression on the tongue is that smokiness. Interesting! After adding water the finish starts off with those burnt nuts again, and the sweetness fades away. A sort of fresh, fruity and bitter note in the shape of grapefruit adds to the mixture. The smoke calms itself down but is still the last taste note of the finish on the palate. This is a whisky I really like. Robust, complex, rich and with more layers than first impressions give away. Initially it really feels like a “typical” Highland whisky, but that little puff of smoke confuses the mental taste library just enough and makes the dram a little bit extra intriguing. Moreover, it can take a bit of water, which makes it interesting to analyse.But to be honest, I mostly drink it just due to the fact that it is damn nice as dram goes, something several guests here at home have agreed on. A hearty but intricate dram, and a perfect chest warmer in the autumn cold.